The latest findings appear online today in The New England Journal of Medicine. HDL’s key function is the removal of cholesterol from plaque in blood vessels and delivery to the liver for excretion. Until recently, this functional property could not be measured. The new study, led by Dr. Anand Rohatgi, Assistant Professor of Internal Medicine at UT Southwestern, measured cholesterol efflux using this new method of measurement in more than 3,000 participants from a multi-ethnic, population-based cohort known as the Dallas Heart Study. The study found that this functional measurement of cholesterol efflux provided significantly different information than did standard measurements of HDL cholesterol. The findings uncovered a significant protective relationship between cholesterol efflux and cardiovascular risk. The better a person’s cholesterol efflux, the less likely he or she was to suffer a heart attack, stroke, or death from heart disease. The association was much stronger for cholesterol efflux than for the traditional measurement of HDL cholesterol level. Atherosclerosis, which is a hardening and narrowing of the arteries, is caused by the buildup of fatty plaques made up of cholesterol and cells on artery walls. Atherosclerosis is the leading cause of heart attacks, and understanding how HDL acts to remove cholesterol from these plaques could offer a target for reducing heart disease risk. This is the first report of a measure of HDL function in a population-based study and supports future studies investigating HDL cholesterol efflux and cardiovascular disease. 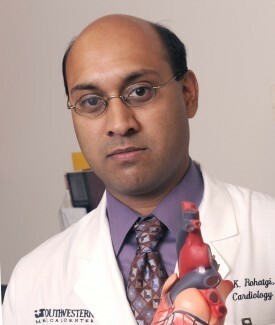 Other UT Southwestern researchers who contributed to the study include Dr. Amit Khera, Associate Professor of Internal Medicine and holder of the Dallas Heart Ball Chair in Hypertension and Heart Disease; Dr. Jarett Berry, Associate Professor of Clinical Science and Internal Medicine; Edward Givens, research technician; Colby Ayers, faculty associate in Clinical Science; Dr. Ian Neeland, cardiology fellow; Dr. Ivan Yuhanna, research associate; Dr. James de Lemos, Professor of Internal Medicine and holder of the Sweetheart Ball-Kern Wildenthal, M.D., Ph.D. Distinguished Chair in Cardiology; and senior author Dr. Philip Shaul, Professor of Pediatrics and holder of the Associates First Capital Corporation Distinguished Chair in Pediatrics. The research was supported by grants from the National Institutes of Health, the American Heart Association, and the Investigator Initiated Studies Program of Merck Sharp & Dohme Corp. The Dallas Heart Study was supported by the Donald W. Reynolds Foundation and by the National Center for Advancing Translational Sciences of the NIH.